Regarding policies relating to enforcement of federal immigration laws. Joined by Senator Jose Menendez, and others. Regarding an interim study on Texas' jail safety practices. Regarding federal immigration policy. Joined by Sheriffs AJ Louderback, Brian Hawthorne, Michael O'Conner, Greg Hamilton, and others. Regarding abortion procedures. Joined by Senators Donna Campbell, Bob Hall, Don Huffines, Van Taylor, and others. The Senate of the 84th Legislature adjourns sine die. Part II begins with a local and uncontested calendar. A joint session with the House of Representatives, honoring those Texans of the United States Armed Forces who have given their lives in defense of the Nation. Note: Audio begins at the 27 second mark. Senate and House budget conferees. Note: Audio begins at the 28 second mark. Local and uncontested calendar; Reading and referral of bills. Note: Audio begins at the 01m:14s mark. Regarding the inaugural Darrington Prison Seminary Graduates from Southwestern Baptist Theological Seminary. NOTE: The committee stood at ease from 00h:07m:23s until 00h:58m:34s. Regarding SB 1735, relating to tuition and fee exemptions at public institutions of higher education for certain military personnel and their dependents. Joined by Lt. Governor Dan Patrick, Senators Paul Bettencourt, Konni Burton, Bob Hall, Kelly Hancock, Juan "Chuy" Hinojosa, Joan Huffman, Lois Kolkhorst, Jane Nelson, Charles Perry, Kel Seliger, Larry Taylor, Van Taylor, Kirk Watson, Royce West, and others. Regarding SB 93, relating to the repeal of the driver responsibility program. Joined by Senator Bob Hall, Senator Don Huffines, and others. Regarding regulation of payday lending and vehicle title lending practices in Texas. Joined by Senator Royce West, Rep. Tom Craddick, and others. Regarding SB 1317, relating to the prosecution of the offense of improper photography or visual recording. Joined by Senator Donna Campbell, and others. NOTE: The committee stood at ease from 01h:36m:38s until 04h:31m:36s. Note: Audio begins at the 30 second mark. Note: Audio begins at the 1 minute 58 second mark. Note: Audio begins at the 25 second mark. Note: Audio begins at the 21 second mark. Note: Audio begins at the 40 second mark. Note: Audio begins at the 11 second mark. Regarding a new report about the Michael Morton Act. Regarding SB 1819 and in-state tuition at Texas universities. Joined by Senator Jose Menendez and Rep. Eddie Rodriguez, and others. Due to a technical failure of the live video broadcast, the complete audio recording has been posted instead. Regarding SB 12, legislation to provide incentives for the conversion of state government vehicle fleets to cleaner-burning natural gas. Joined by Railroad Commissioner David Porter, and others. Regarding SB 1135/HB 496, relating to civil and criminal liability for the disclosure or promotion of certain intimate visual material. Joined by Rep. Mary Gonzalez, and others. Regarding SB 1084, relating to ad valorem tax appeals on the ground of the unequal appraisal of property. Regarding SB 9/SJR 2, relating to the constitutional limit on the rate of growth of appropriations. Joined by Senator Brian Birdwell and Senator Charles Schwertner. NOTE: Audio begins around the 13 second mark due to technical difficulties. Due to a technical interruption to the live video broadcast, the complete audio recording has been posted instead. Regarding SB 185, relating to the enforcement of state and federal laws governing immigration by certain governmental entities. Joined by Senators Sylvia R. Garcia and Jose Rodriguez, and others. Regarding debt reduction and tax relief proposals. Regarding a package of legislative proposals relating to education. Joined by Senators Paul Bettencourt, Donna Campbell, Eddie Lucio, Charles Perry, and Kel Seliger. Due to technical difficulties, the audio begins during the roll call, at approximately the 30 second mark. Regarding management of the state Medicaid program. Joined by Senators Konni Burton, Donna Campbell, Brandon Creighton, Bob Hall, Don Huffines, Lois Kolkhorst, and others. Regarding SB 1, SB 7 and SB 8, relating to tax relief measures. Joined by Senators Paul Bettencourt, Brian Birdwell, Konni Burton, Troy Fraser, Joan Huffman, Lois Kolkhorst, Larry Taylor, Van Taylor, and others. Regarding legislation relating to transportation funding. Due to technical difficulties, the audio begins during the invocation. Regarding property tax relief legislation. Joined by Senators Brian Birdwell, Konni Burton, Donna Campbell, Bob Hall, Don Huffines, Charles Schwertner, and Van Taylor. Regarding SB 538, relating to the control of infectious diseases. Joined by Senators Lois Kolkhorst, Charles Perry, Jose Rodriguez, Van Taylor, Carlos Uresti; and others. Regarding border security and immigrant rights issues. Regarding border security measures. Joined by Senators Paul Bettencourt, Brian Birdwell, Donna Campbell, Brandon Creighton, Troy Fraser, Bob Hall, Kelly Hancock, Don Huffines, Joan Huffman, Lois Kolkhorst, Jane Nelson, Robert Nichols, Kel Seliger, Larry Taylor, Van Taylor; and others. Regarding legislation aimed at strengthening DNA testing laws for wrongfully convicted Texans. 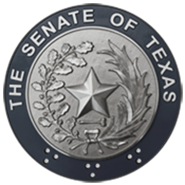 AUDIO DIFFICULTIES: Due to technical difficulties with the Senate Chamber's audio recording system, the audio level of this video is very low for approximately 22 minutes. Regarding Orange and Maroon Legislative Day, 2015. Joined by Texas A&M University Interim President Mark Hussey, University of Texas President Bill Powers, and others. Regarding a proposal for transportation funding. Joined by Transportation Committee Chairman Senator Robert Nichols, Senator Brandon Creighton, Senator Bob Hall, and Senator Don Huffines. Audio begins after several seconds due to technical difficulties. Regarding the new "Two Steps, One Sticker" registration and inspection program from the Texas Department of Motor Vehicles (TxDMV). Regarding a proposal to expand Texas' sales tax holiday. Joined by Rep. Dwayne Bohac, and others. Regarding the Senate's base budget for the 84th Session. Joined by Lt. Governor Dan Patrick. Regarding legislative priorities of the Senate Hispanic Caucus (SHC) and the Mexican American Legislative Caucus (MALC) for the 84th session. Joined by Senator Sylvia R. Garcia, Rep. Mary Gonzalez, and others. The Senate met jointly with the House of Representatives for the 2015 inaugural ceremony for the Governor and Lt. Governor.